(Johänn) Christian Ludwig Gersten (or Gerstein) was born on 7 February, 1701, in Gießen, a town in the German federal state of Hessen. He studied law and mathematics at the University of Gießen and in the beginning of 1730s he travelled to London, England, to improve his mathematical knowledge. In London in 1733 he became a fellow of the English Royal Society. In the same 1733 he return back to Gießen, to accept the position of a professor of mathematics at the University of his home town. 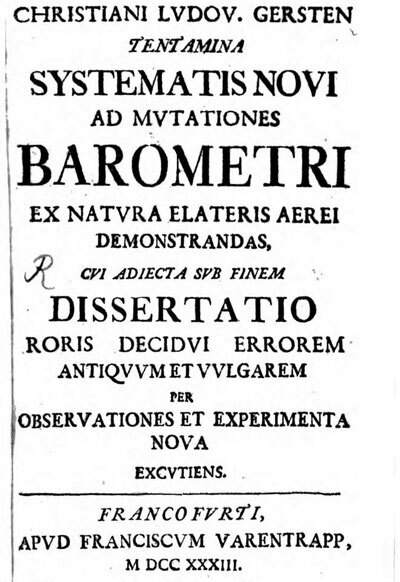 As a scientist, Gersten is primarily known by his dissertation work, published later as a book, describing a series of experiments, using the barometer, titled "Tentamina Systematis Novi ad Mutationes Barometri ex Natura elateris Aerei demonstrandas, cui adjecta sub finem Dissertatio Roris decidui errorem Antiquum et vulgarem per Observationes et Experimenta Nova excutiens" (see the nearby image). Gersten as a matter of fact was the first scientist to find out, based on observations, that dew did not fall from the heavens, but ascends from earth, especially from plants. He is also the author of several other books in the fields of astronomy, physics and mathematics. In 1735 Gersten travelled again to London, to present to the Royal Society his project of arithmetical machine (see the calculating machine of Gersten). It seems Gersten was a quite active person not only in the field of science, but also in public affairs, and latter lead him into severe troubles. Gersten was admired in 1720s for his calculating machine by Landgraf of Hesse-Darmstadt Ludwig V, but that was not the case with his son, the Landgraf Georg II. In 1744, Gersten wrote a petition to the Landgraf, which was considered as offensive. The Landgraf accused Gersten, and initiated a trial against him. Having a presentiment what will be the result, Gersten decided to escape the justice and in 1745 left the town. Initially he settled in Altona bei Hamburg, and informed the University officials, that he is not going to return to Gießen and lost his position. Then he travelled to St. Peterburg, Russia, may be to some other places also, but finally decided to return to Germany. And then his disrespect to the Landgraf and the attempt to escape from the justice finally got him into big troubles. 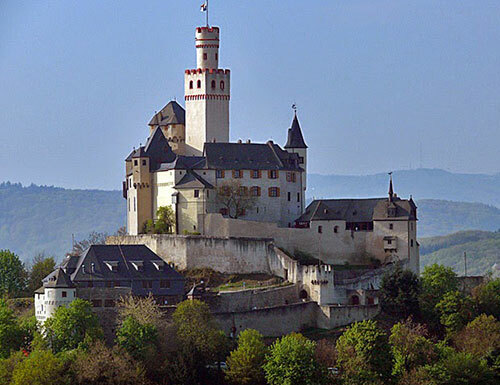 In 1748 he was arrested in Frankfurt am Main by request from Darmstadt, and condemned to lifetime detention at the castle Marxburg bey Braubach (see the lower image). Gersten never recognized his mistakes, and repeatedly addressed the court with offensive petitions. Interestingly, despite his problems with the justice, in 1748 he was partly restored as a professor at the University of Gießen and was allowed during his stay in the castle to teach young people in mathematics. Gersten was eventually released as late as in 1760. Christian Ludwig Gersten died on 13 August, 1762, in Frankfurt am Main.